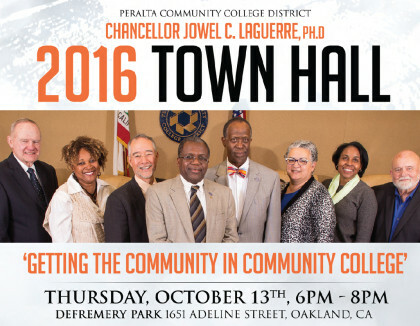 Please join Trustee Julina Bonilla and Chancellor Jowel C. Laguerre, Ph.D., for a Chancellor’s Town Hall Thursday, Oct. 13, from 6-8pm, at Defremery Park, 1651 Adeline Street in Oakland. The Town Hall will feature some of Peralta’s special programs, such as EOPS and our articulation agreements with UC, Historically Black Colleges and Universities and others. The event is free and open to the public and refreshments will be served. Don’t miss this great community event. RSVP today at https://www.eventbrite.com/e/pccd-chancellor-laguerre-community-town-hall-meeting-tickets-27500795620.